Have you discovered the benefits of attractive patio roll up doors? If you haven't heard much about these stylish patio door shutters yet, you'll discover some important benefits by taking a brief moment to learn more about them. A growing number of upscale custom home builders now incorporate this feature into architectural design and interior decorating plans. Together with breezeway shutters, this technology offers impressive advantages. Today, millions of Canadians reside in properties which include patios. Even some commercial sites now embrace this feature, too. Typically accessed via glass doors, these locations provide ready egress to the outdoors; they sometimes adjoin decks, gardens, or private rear entrances. While patios add value to fine dwellings and boutiques, this popular design feature does harbor two rather significant drawbacks. First, transparent patio doors may detract from privacy. When allowed to remain untinted, the glass permits people outside the structure to surveille the interior easily. Second, readily accessible patios also sometimes pose a security risk. An intruder may jimmy open sliding glass doors, or even break the glass and enter through the opening. 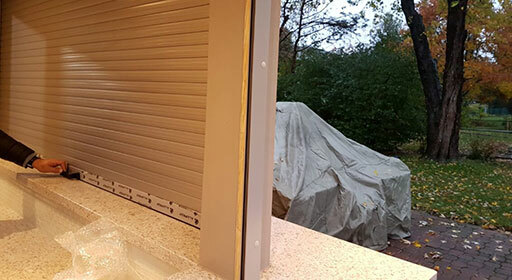 Fortunately an intelligent solution exists for resolving patio privacy and security problems: patio roll up doors equipped with secure patio doors feature. Perhaps not surprisingly, these doors have recently gained wider use. As more customers appreciate their advantages, the popularity of well-manufactured, fashionable patio roll up doors will likely continue to spread. A closely related product, breezeway doors, helps secure open corridors leading between the interior of buildings and outer wings, outbuildings, or garages. Presently manufacturers produce two primary types of patio rolling shutters, manually operated models and electric (i.e. motorized) models. The former raise or descend over a door or window opening with the assistance of a hand-powered crank, while the latter offer push-button convenience. The shutters themselves somewhat resemble a cross between conventional aluminum blinds and garage doors. Our beautiful patio roll up doors offer strong aluminum construction and important easy maintenance features. They occur in a variety of lovely colours. Made in Canada, these products enhance privacy and security, while also protecting glass doors and windows against hail, sleet and blowing debris. We welcome inquiries from readers interested in learning more about these in-demand rolling shutter products. They contribute to both commercial and residential properties nationwide. Contact us soon to obtain detailed information about current models, customization, and pricing. We look forward to hearing from you! Are Roll Up Garage Doors Right For You?